Whether you've decided you'd like to have a crack at writing your own blog posts, or you want to optimize your current writing process, this is sure to give you a boost. I've spent a while now trying to find faster ways to do it without sacrificing quality. One particular Bill Gates quote always stuck with me, even before I got into the business world. He said, "I choose a lazy person to do a hard job. Because a lazy person will find an easy way to do it.” At first I thought, surely a hard worker is better than a lazy worker! But it made sense. A smart but lazy person will instinctively optimize anything they have to do for maximum efficiency. Now, I don't want to toot my own horn too much, but I think that my amount of laziness sometimes would do ol' Bill proud! I've worked at optimizing my blog writing process, and I've discovered some pretty darn helpful things. The idea of "optimization" through organization, can seem like more work than just sitting down and writing. I found, however, that with this process I am more relaxed than ever. It requires a lot less mental churning. Creating a title will naturally refine your topic and set the integral focus for your post. Browse through forums in your niche to see what people are looking to know. Browse other blogs in your niche to get an idea of hot topics. Do some keyword research around the topics you've found, or any other topics that you think could be good. "The Productivity-Optimized 5-Step Blog Writing Process"
People also like to see a number in titles, just like they do in email subject lines, as I mentioned in my last post. It promises structured content and invokes curiosity. What are those points? What are those steps? You don't have to know the number of points you'll have before you start, in fact often you won't know till you've done your research and planning. I usually use an "X" as a place-holder until I know, i.e., "The Productivity-Optimized X-Step Blog Writing Process"
You can adjust your title later (it's not set in stone) but coming up with one right from the beginning and keeping it in mind as you go is a good way to get consistency throughout your research and planning. Listing your initial ideas will help you to refine your topic and guide your research. If you have any ideas at all about what you'd like to cover in your post already, jot them down. Make a little chart or outline if you like, but I usually just create a bullet point list in a Word document. This will help with your research, and also help you to refine your concept. An efficient blog post has enough information to keep it interesting and informative, but doesn't cover everything under the sun in one place. It's kind of like choosing a sub-niche to focus on with an affiliate website, rather than targeting the broader niche as a whole. If you had a St. Bernard dog, you'd be more likely to go to a St. Bernard Training website than a generic dog training website. Just like that, if you hone in on something specific with your blog post, people looking for that information will be drawn to the direct approach of your post. If you're planning to research a topic you know nothing about yet, then just jot down a couple of questions you already have, and ideas of what you think might go into such an article. Separate your resource hunt and your mental-digestion of the information into two separate processes to minimize clutter and cognitive load. Time to pay a visit to your best friend: Google. Start by typing in keyword related to your main point. For example, for a post like this one, I might search "blog post writing productivity tips" and see what comes up. Skim the titles, and if anything looks good, open it in another tab. Take a quick glance at the page. If it looks promising, copy the link into your document, and then close it. You aren't reading through these sources yet, just making a list. Later you will go through them one by one, making quick notes. I found that this way of only having one or two tabs open at a time throughout my research makes everything seem so much less overwhelming. When I started out, I'd open masses of tabs, skim through them trying to figure out what information I needed, make mental notes and then struggle to find what was what later. I began to realize that it was like throwing things on the floor of your room and leaving them to clean up later. You end up with an overwhelming mess. Cleaning up as you go is much easier. List a few relevant links this way, and then try Googling other points you jotted down in the previous point. For each, collect another couple of links to articles that look promising. Once you have a solid list of resource links — I'd say at least 10 but no more than 20 — you're ready to open them one at a time. Only having the one article to focus on at a time, without a bunch of tabs cluttering your browser, makes it feel easy. You can skim each article to begin with to see how much valuable information is there, and make more notes for some than others. One-by-one doesn't mean that you have to spend forever on each article, it just provides order in your filtering of information. Copy/pasting your research links and notes into a spreadsheet is quick and easy, and it will make writing straightforward and simple. By the time you've finished writing notes, you'll have an idea of the common themes around your topic. Look over your notes and original points to build the final list of points to cover in your post. The more evidence from your research to back those ideas up, the better. If you're a total spreadsheet geek like I am, it only takes a couple of minutes to do one final bit of organization for your research, once you have your list of points and the links to all the research. I put my final list of points down the left hand side of my spreadsheet, and my research links along the top, although depending on your number of points vs. your number of links, this is easily reversible. Here's an example of a quick one for a blog post about writing newsletters. This will only be a quick case of copy/paste if you've done the previous step, and it means that when you go to write each point, you can easily see which notes you have to support it, and where they came from. Everything is set up so that you can refer to your research without having to do a single bit of hunting or sorting through notes and links. I'm a particularly visual person, so if you are too, you might find this of particular use for organizing your points, research, thoughts and relieving some of that cognitive load. If you find as you write that you need more to back up any given point, you can add it easily! 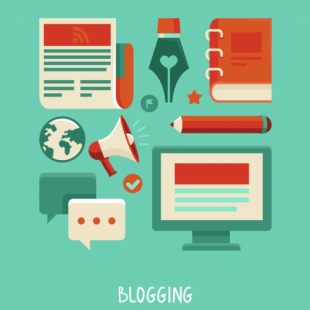 Writing your blog post is now straightforward. You'll have time and energy leftover to add personality, making your post a winning combination of information and enjoyability. With all of your research done and organized, writing becomes a breeze. Go through the spreadsheet one point at a time, and start writing out the facts and evidence. Then, when all are done, comb back over and add some personality. People are looking to find answers to their questions or information that can help them advance, and if you can provide that they'll appreciate it. But they'll just as easily forget you when they're gone. You make it informative and interesting? They'll remember you, and come back for more. Keep it up, and you're on the road to a healthy following. Add in some examples or analogies, or some quirky statements that tie in with your points. You already know you've provided the valuable information, so making it fun to read will only add to that. As this "add personality" or "make it fun" part can be less straightforward than simply presenting facts, I've got some articles you might find useful. I urge you, however, to remember above all to keep your audience's tastes in mind, especially when using humor. "Bad taste" humor can produce laughter from some, and a blank stare of utter distaste from others, so tread carefully! So there you have it: a process refined by a laziness-fueled but quality-valuing blogger. Now be brave, go forth, and conquer... efficiently!